The White Rhinoceros is an odd-toed ungulate mammal. It is the biggest of all the odd-toed ungulates, and the fourth biggest living land mammal after the elephants. The largest recorded White Rhinoceros weighed about 4530 kilograms (9600 lb). It usually weighs between 1350 to 3600 kilograms (3000 to 14000 pounds). The males are slightly heavier than the females. It has a short neck and a very broad chest. The head and body length is 3.4 to 4.2 metres (11 to 14 feet). The tail is about 50 to 70 centimetres (20 to 27 inches). Its shoulder height is about 1.5 to 1.9 metres (60 to 80 inches). On its snout it has two horns, one behind the other. The front horn is larger and it is about 90 centimetres (3 feet) in length. The back horn is smaller. It measures about 55 centimetres (22 inches). An average pair of White Rhinoceros horns weighs about 6 kilograms (13 pounds). The horns are not true horns like the horns of a buffalo, antelope or sheep. It grows from the skin and is made from the same material as hair and toenails. The White Rhinoceros is the only mammal with horns that don’t have a bone inside. The horns are replaceable – if they get torn, a new horn will begin to grow, and in young rhinos it may be replaced completely. Isn’t that cool? Females use their horns to protect their young rhinos, while males uses their horns in fights with other rhinos. The horns are used for Traditional Chinese medicine in China, Taiwan and South Korea. People think that it reduces fever and headache, even though it’s just toenail stuff. It is also used to make traditional necklaces. This is one reason why White Rhinoceroses are hunted. 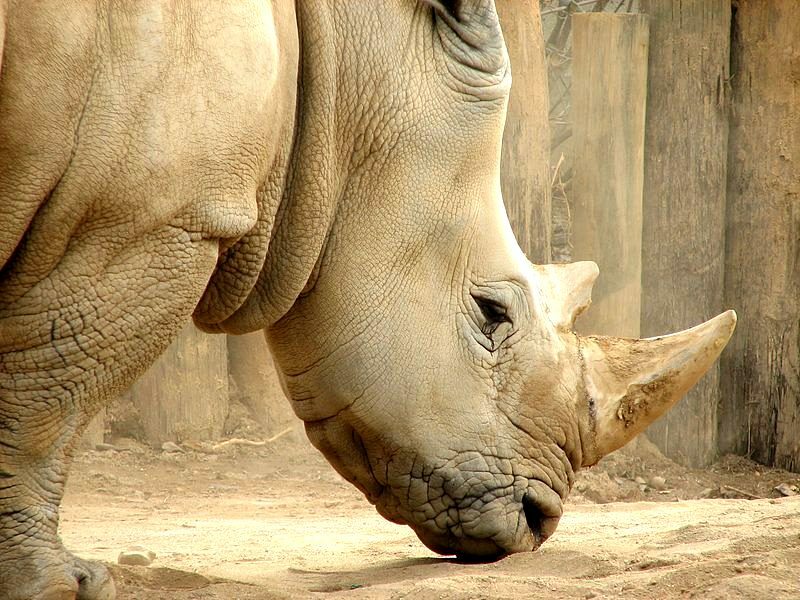 The White Rhinoceros also have a hump on the back of their neck. The powerful muscle in the hump allows the White Rhinoceros to lift its heavy head up from the normal grazing position very quickly. They do not have canines or incisors, instead they use their wide squared lips to bite grass off the open grasslands in South Africa. They grind the grass between two molars on the top jaw and two molars on the bottom jaw. They have a good digestive system to digest these poor quality grasses. Each of the 4 stumpy White Rhinoceros feet has three toes. Therefore, their footprints are shaped like the ace of clubs. They have very little hair on their bodies compared with most other mammals. Their only hair is on the fringes of their ears and on their tails. 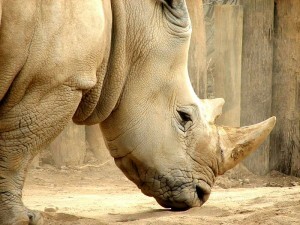 They are called White Rhinoceros because of their wide squared lips. The word “white” has nothing yo do with the colour of their skin, which is not white – instead, it’s because the Dutch word for “wide”, or wijd, sounds like the English word for “white”. They are also called the Square-Lipped Rhinoceros, or Ceratotherium simum. Their colour ranges from yellowish brown to grey. They are herbivore grazers that eat grasses. They prefer to eat the shortest grains. The White Rhinoceros is one of the biggest animals that just eats grass! It drinks twice a day if water is available, but if there is a drought it can live 4 to 5 days without water in South Africa. They can drink up to 80 litres (20 gallons) of water a day. The White Rhinoceros has no sweat glands. On hot days, they will play and bury themselves in a mud pit. The mud keeps the White Rhinoceros cool. The mud also act as a natural bug repellent for the White Rhinoceros. It protects the White Rhinoceros from biting flies and ticks. The White Rhinoceros has a mild and gentle personality. They tend to avoid conflict. White Rhinoceros may look slow when they are walking but they are able to charge fast at short distances. The White Rhinoceros can run at 50km per hour (30 mph) for short distances. White Rhinoceroses are able to grunt, snort, squeal when distress or growl when they are threatened. They live in a herd which consists of up to 14 animals. They are usually female rhinos. Most adult male White Rhinoceroses live alone. The strongest male White Rhinoceros marks its territory with its poo and pee. The dung is laid in piles. It may have 20 to 30 of these piles of dung to warn other White Rhinoceros not to invade its territory. Isn’t that a unique way of defending a territory! Another way of marking its territory is wiping its horns on bushes or the ground and scraping with its feet before spraying urine. The White Rhinoceros has weak vision. It is able to see a moving object up to 150 feet (45 metres) away but they are unable to locate a person who is standing still only 100 feet (30 metres) away. But they have excellent senses of smell and hearing. Female rhinos normally only give birth to one baby rhino at a time. The baby rhino will weigh between 40 and 65 kilograms (90 to 140 lb). The baby rhino, called a calf, will be protected by its mother against all predators. She will fight vigorously to keep her calf safe. It will not be able to walk steadily for the first 2 to 3 days of its life. The calf starts to nibble on grass after 3 months, but only stops taking its mother’s milk after a year or more. The calf will squeal when it wants milk. The mother will only have one calf every two and half to five years. Before she gives birth to a new calf, she will first chase away her current calf. The calf does not live on its own until it is about 3 years old. Adult White Rhinoceroses have no natural predators because of their large size. Even the young ones are rarely attacked because their mother is always there to protect them. Anyway, no animal would enjoy eating them because of their tough skin. White Rhinoceros can live up to 40 years old in the wild and up to 50 years old in captivity. Unfortunately the population of White Rhinoceros is dwindling die to illegal hunting and habitat loss. 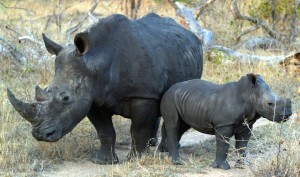 Conservation efforts have been carried out to protect these rhinos from extinction.